Love is in the air this time of year! 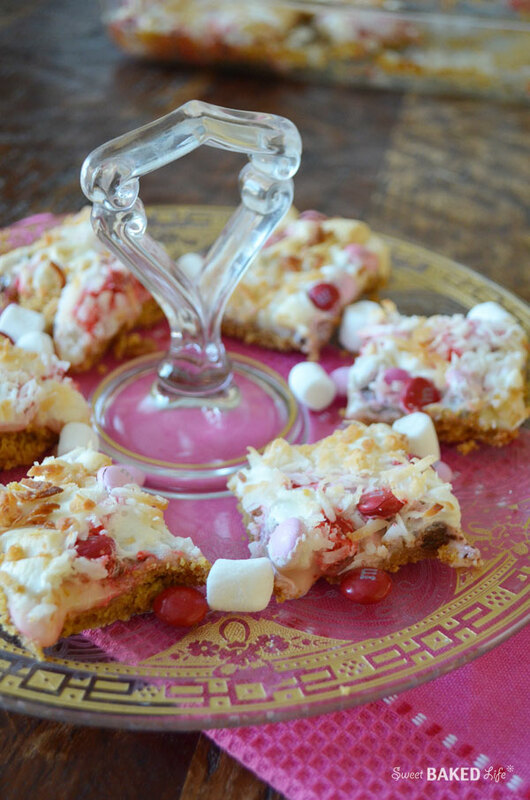 So get some sweet love baking in your oven with these decadent Valentine M&M Cookie Bars. 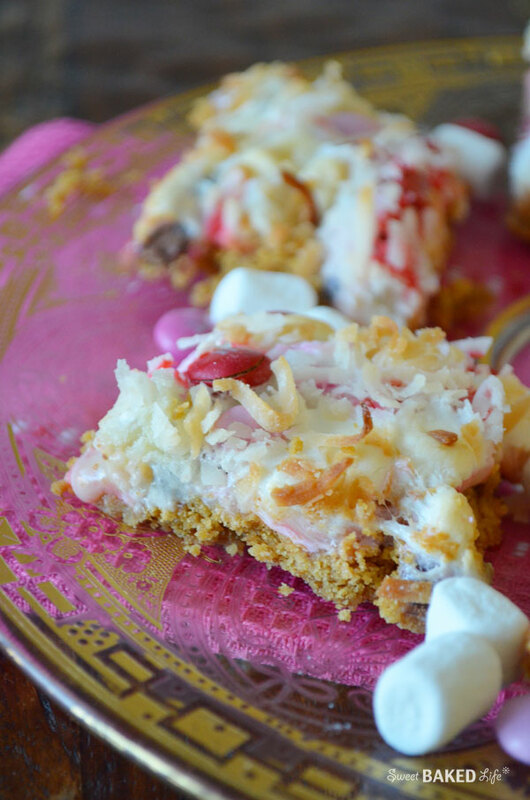 You see, I decided to give those traditional magic cookie bars a pink and pretty makeover to celebrate the month of love. As these bake, the amazing aromas will fill your home and heart and make you wish it was Valentine’s Day all year ’round! You definitely won’t be able to resist this layered goodness of a buttery graham cracker crust, layered with sweetened condensed milk, covered with mini marshmallows and pretty chocolate valentine colored M&M’s and topped off with a handful of coconut; then they’re baked until golden browned and gooey! In the bottom of a 13 x 9-inch baking pan add melted butter. Make sure the butter is distributed evenly in pan. Gently pour graham cracker crumbs over the top and press down lightly with your hands. Pour sweetened condensed milk evenly over crumbs. Layer with half of the marshmallows, M&M’s, the remaining marshmallows and top with the coconut. Press down firmly with your hands. Bake for about 30-35 minutes or until the marshmallows and coconut are lightly browned. Cool on wire rack then cut into bars. 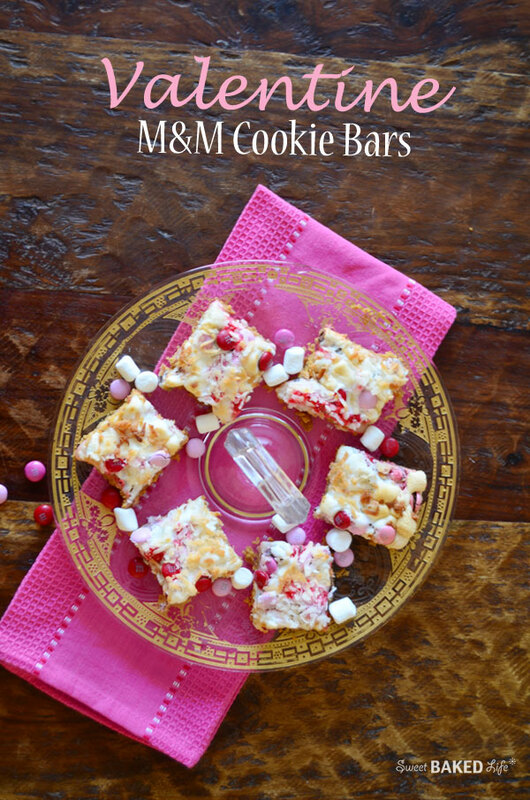 Spread the love today with these simply irresistible Valentine M&M Cookie Bars! Thanks Jess! They are scrumptious — a must try! There’s so much loveliness in this post! Your photos and cookies are gorgeous, perfect for Valentines! you’re right! I can’t resist the graham cracker crust! Yep, can never have enough graham crackers, love em!